For this Backyardigan's cake, I made three 9" round cakes. Two are left whole and stacked and one is cut in half and stacked behind the "background" of the backyard. 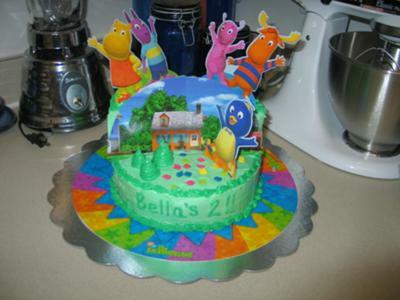 All the decorations are from the Backyardigans centerpiece that can be found in a party supply store. I used the backyard for the background (it had to be trimmed a little), the base of the centerpiece is under the cake, and the characters were all included with the centerpiece and are just pressed into the cake. It was very easy! !